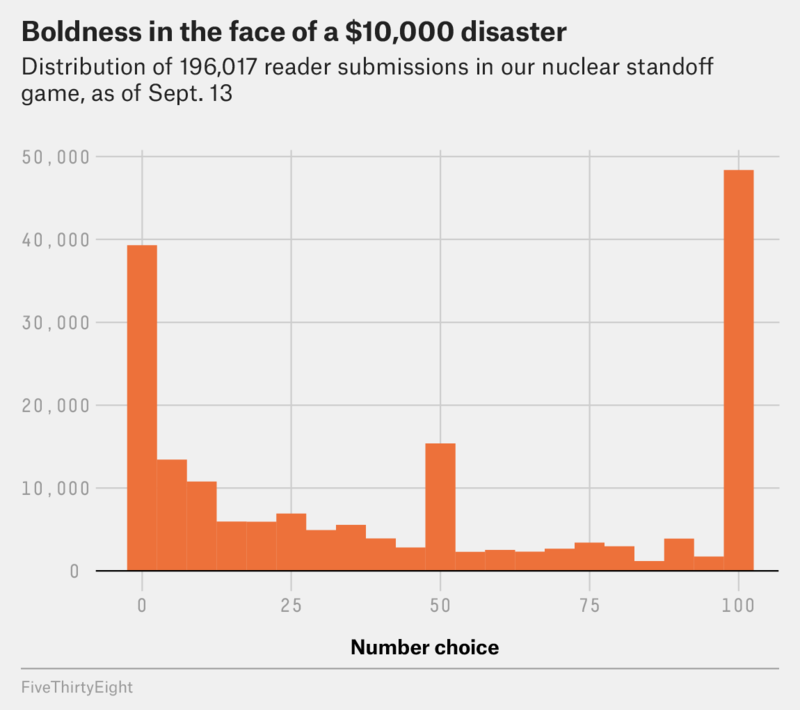 Let’s all be thankful that FiveThirtyEight readers don’t control America’s nuclear arsenal. In the real world, the $100 is analogous to some international concession and the $10,000 is the high cost of all-out nuclear war. The two players are bidding for the “$100” in the currency of nuclear risk. As of Wednesday afternoon, FiveThirtyEight readers had played this game nearly 200,000 times and the results are in. They are calamitous. The median submission was 33, the mean was 43 and the most common entry was 100 — in other words, uncompromising aggression. Disaster occurred over 20 percent of the time and nearly $2,000 was destroyed, on average, per game. We can only hope our world’s leaders have taken a proper accounting of the stakes.